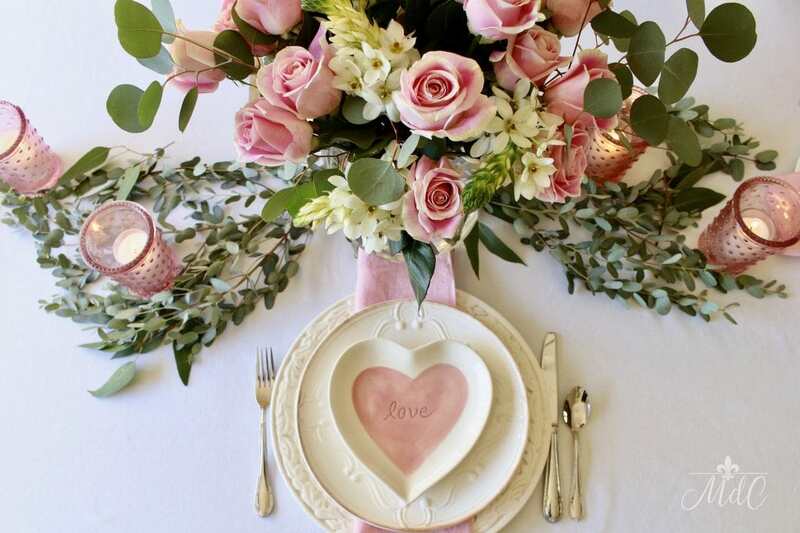 I’ve been a little uninspired in the decorating department since taking all the Christmas decor down, but with Valentine’s Day coming soon, it’s the perfect excuse to break out some pretty pink decor! 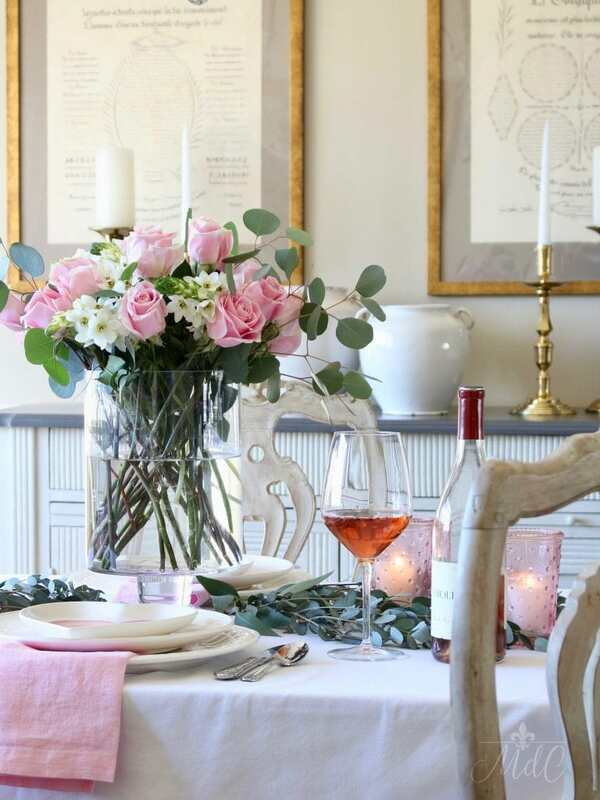 Today I’m joining some talented blogging friends for the Styled + Set Entertaining Blog Hop. If you’re coming here from our host, Lory of Designthusiam, I’m so glad you’re here! Call me crazy, but I love creating tablescapes. For me, it’s a chance to be creative and to use the different sets of dishes that don’t get pulled out all the time! 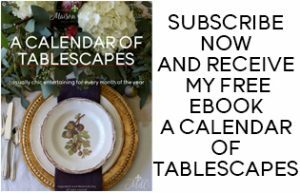 If you love them as much as I do and you’re looking for more tablescape inspiration, be sure to check out my free e-book full of twelve of my favorites! 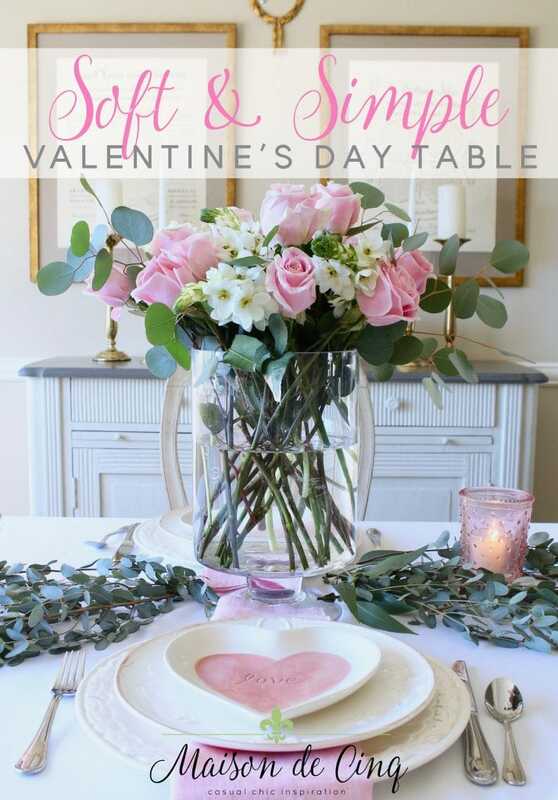 Since my husband and I don’t typically go out to a fancy dinner, this is a chance to set a soft and simple Valentine’s Day table at home for us. And for the last couple of years, that’s what I’ve done. If the kids are out or have plans, I set a pretty table and make a special dinner. And if the kids are home, then I just make it a bigger table! Either way, it’s nice to make a little extra effort to make it feel like more than an average night. And although this year I did use pink roses, roses definitely aren’t required! In fact, last year I set a Valentine’s table with tulips, and I’ve used hydrangeas before, too. I want it to look pretty, but I want it to be simple and easy, too. For some reason I really wanted to use soft pinks this year, and I had it in my head that I would get faded pink roses. Good thing Trader Joe’s had just the color I wanted! 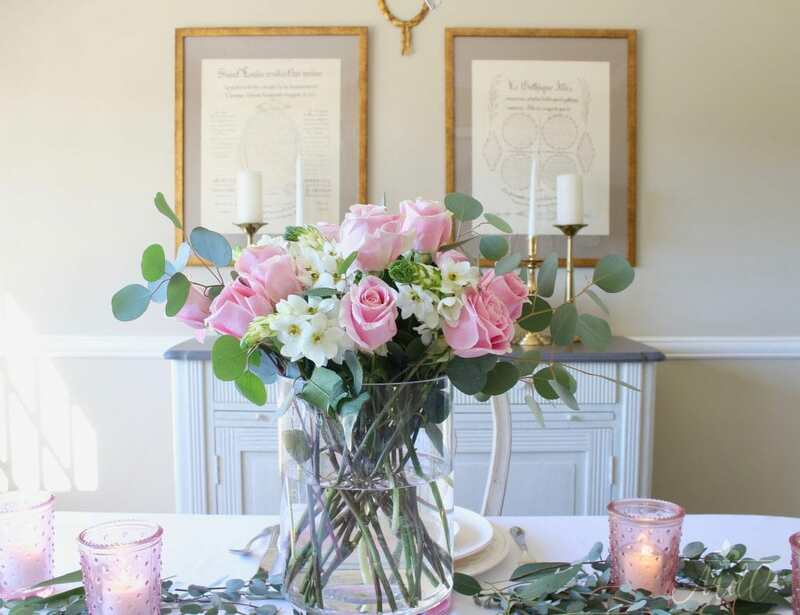 I mixed the pink roses with some white flowers that I already had in the house, along with my favorite eucalyptus, and my centerpiece was born. 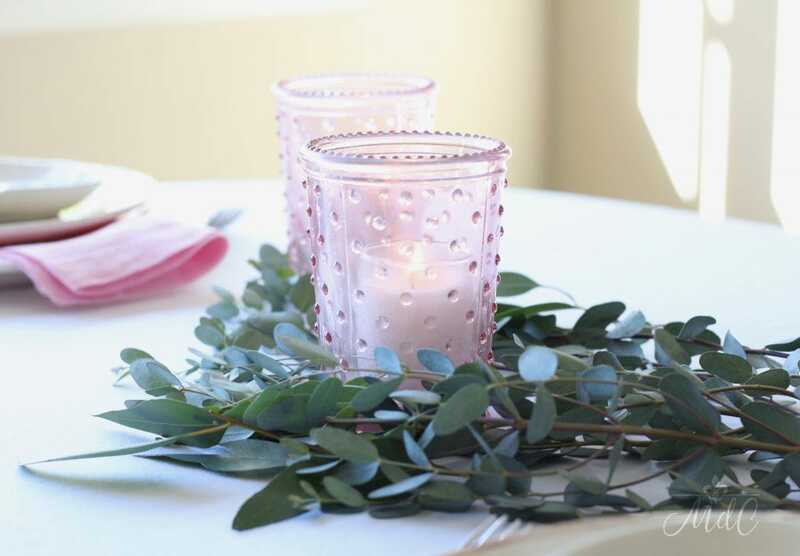 I added the pink hobnail candleholders and some more eucalyptus scattered on the table. 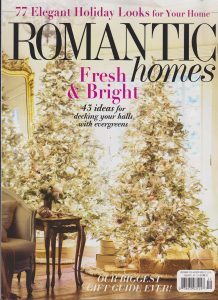 I love the greyish-green of the eucalyptus mixed with the soft pinks – such a pretty combo! 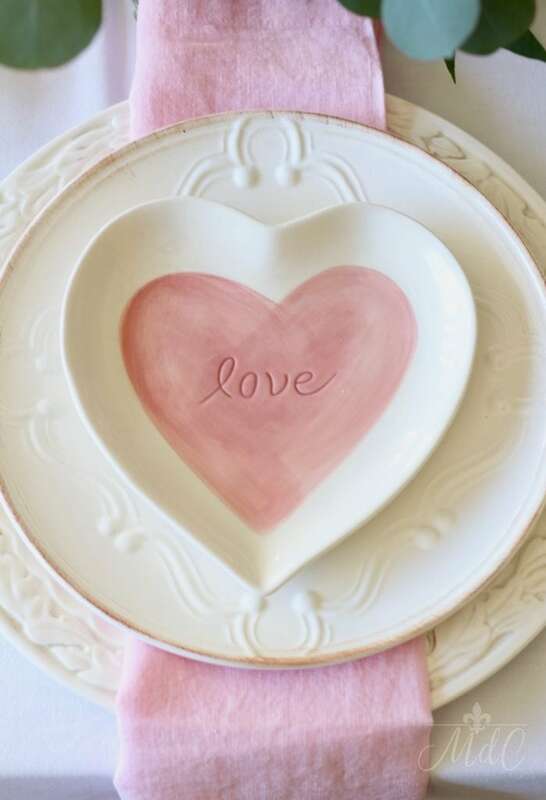 Once I had the centerpiece, I knew I would use these Pottery Barn “Love” plates that I bought last year! I love them and didn’t get a chance to use them, so I’m glad to be able to this year. And believe it or not, they are still available here! The clear glass vase is from Target (yes, Target!) and I love it! It comes in two sizes and I have to say, they are the perfect basic vases! They are sturdy, I love the shape, and they were a great price, too. One thing I did buy were these pretty pink linen napkins from Sur la Table. I love linen, they were on sale, and they are the perfect color! They’ll work for Valentine’s Day again, and could also come out at Easter, or for a spring dinner party. Layering plates is something I love to do, so I almost always use a charger. Originally I was going to use a gold charger, but it just seemed too bright and too much. So I switched to the white chargers, and I love how they work so well for my simple Valentine’s Day table. The brass candlesticks on the buffet are a mix of vintage finds and Pottery Barn. 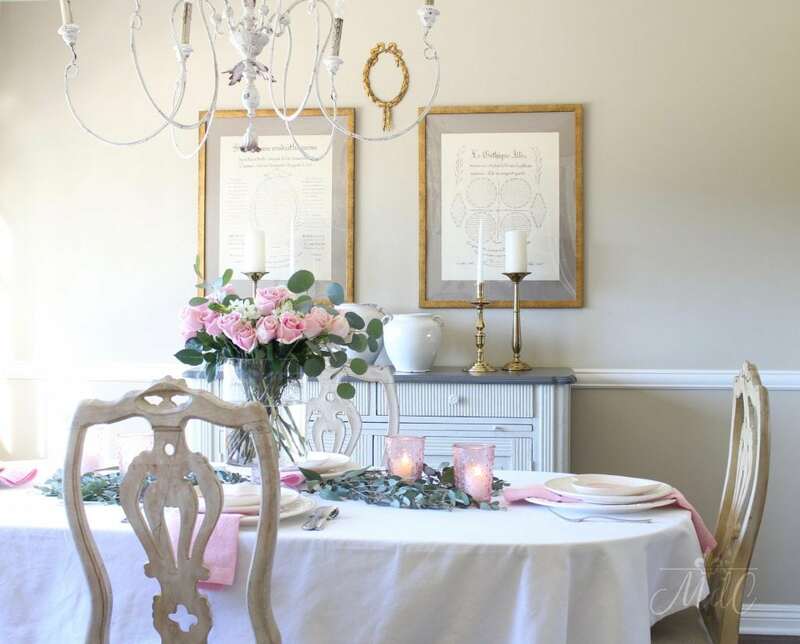 To continue with the entertaining tour, take a minute to stop by the other bloggers sharing their tables as well. 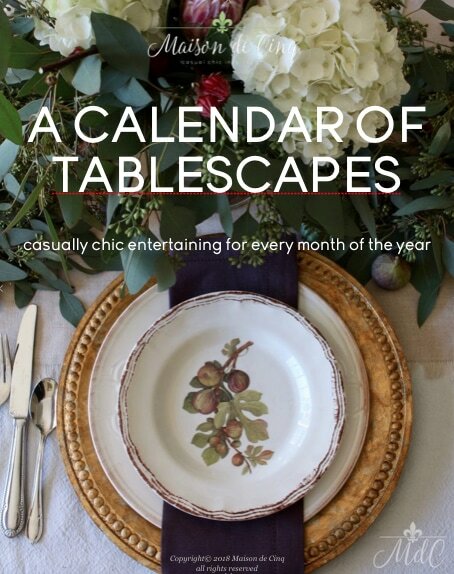 And don’t forget to sign up for my emails to get my free e-book, A Calendar of Tablescapes! 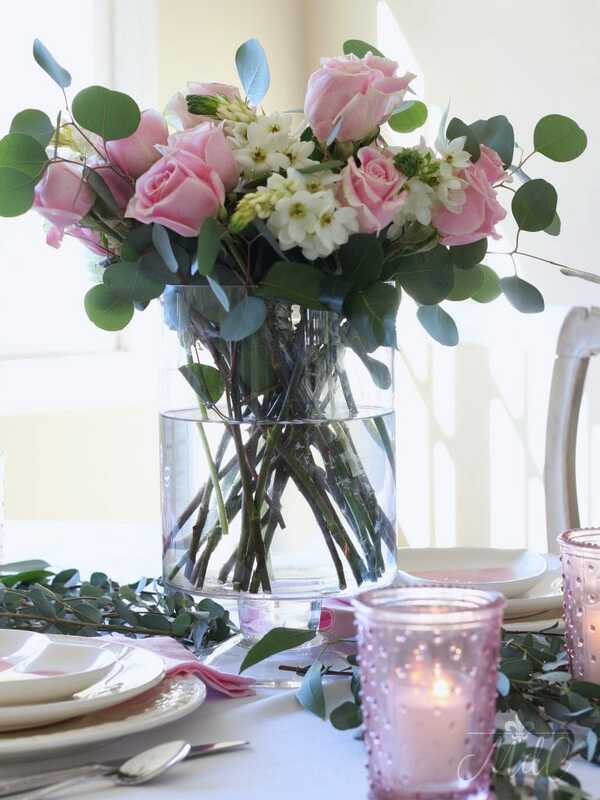 I love your romantic table with those pretty roses. Hearty shaped plate is cute. Thanks for the ideas! Sheila, what a beautiful table! 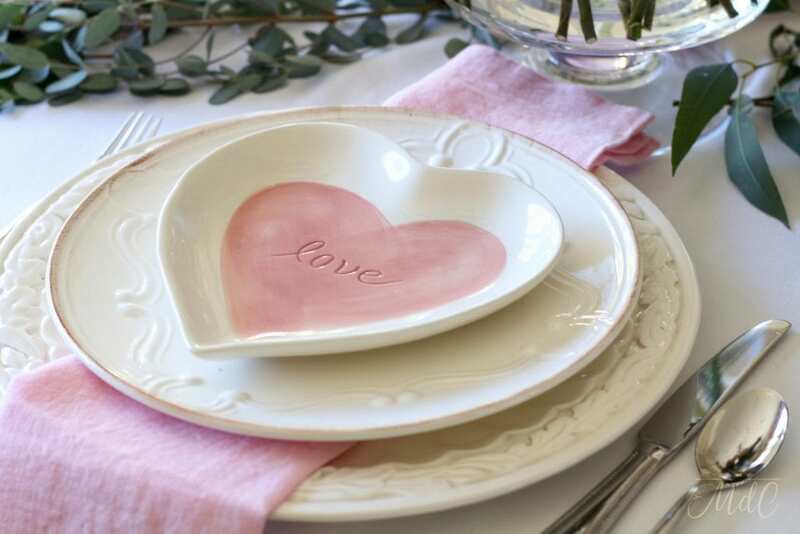 I LOVE those little love plates! So adorable. Of course I also love your chandelier, artwork and chairs…okay everything. Aww thanks Jamie – you’re so sweet! I love that you love everything of mine since I love everything in your house! Your flowers are just stunning! 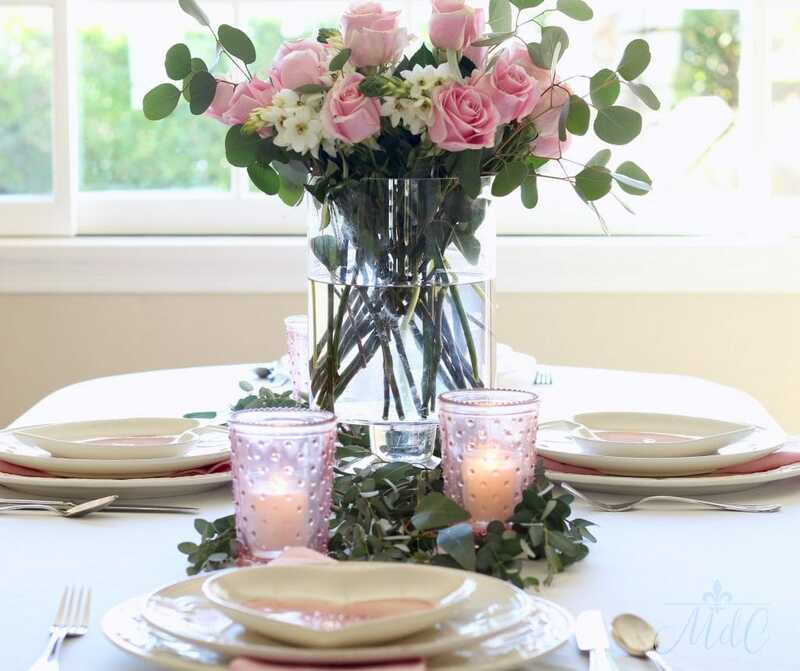 I love the color of those pink roses and the pink glassware. Thanks for sharing! Absolutely lovely Sheila! The pink is just so delightful. 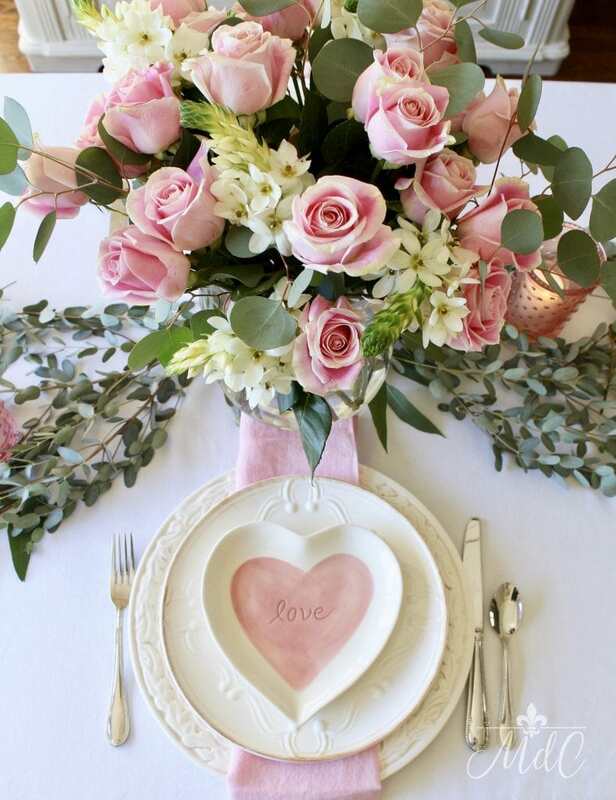 Gorgeous flowers and each touch like the love plates set the tome for a beautiful Valentine’s Day! Thank you Kelly! 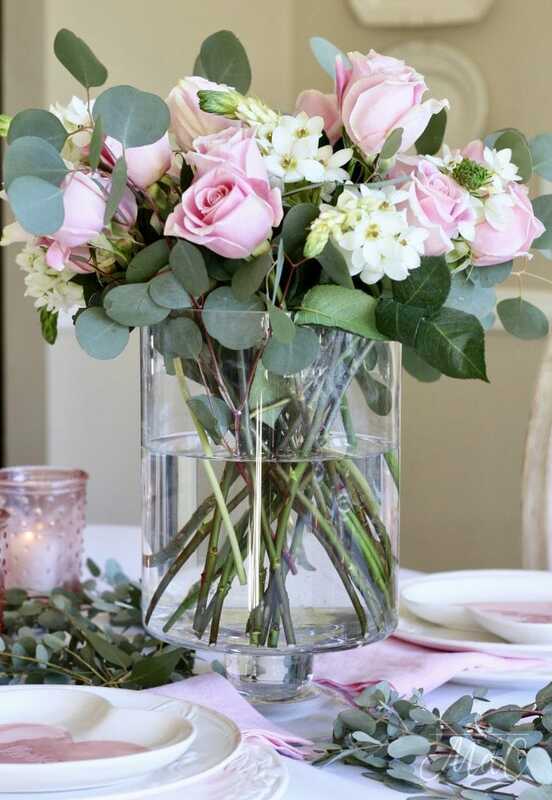 It’s pretty hard to go wrong with beautiful pink roses isn’t it?! Everything is so beautiful and is very romantic. A lovely post. This is my first visit to your blog, I enjoyed it very much. Thanks so much Heather! Those were from Target last year, believe it or not! Sheila, I love your table, so soft and romantic! The touches of pink balance the white out perfectly. Whoever is lucky enough to join you for dinner is blessed! Thank you so much Lidy! And Happy Valentine’s Day to you! Thank you Candy! And thanks so much for stopping by and taking the time to comment – I so appreciate it! Thank you Lory! I think you should get them – how cute are they?! And thank you again for having me! I love touring with all of you talented ladies! Have a great week! How beautiful, Sheila! I love all the pink and those adorable plates. The room is glowing! Awww thanks so much Shelley! And I love the plates, too! How adorable are they?! Thank you for stopping by my friend!